Helping You Think Things Differently. TFHL is the creator of Tinfoil Therapies. She asks obvious questions, subverts consensus reality, probes public paradox, shines a light on ancient knowledge....all while you laugh, or think, or both. 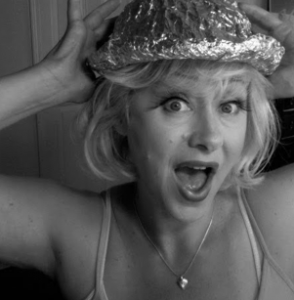 Tinfoil Hat Lady is the alter ego of Beata Van Berkom. She is a human being, interested in alternative health investigation, alternative history research, theatre artist (director, writer and actor.) TINFOILHATLADY The character came from her 2007 one woman show The Subversive Lecture of Tinfoil Hat Lady found on youtube. TFHL is now the Ann Landers of the 'Heebly Geebly' or metaphysical alternative world. The lighthearted, yet informed 'GO TO' Lady for information on the hidden historical and spiritual.